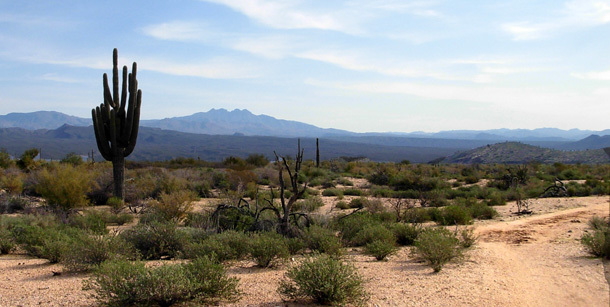 the desert surrounded by beautiful mountain views. so you get to see the trail both ways. 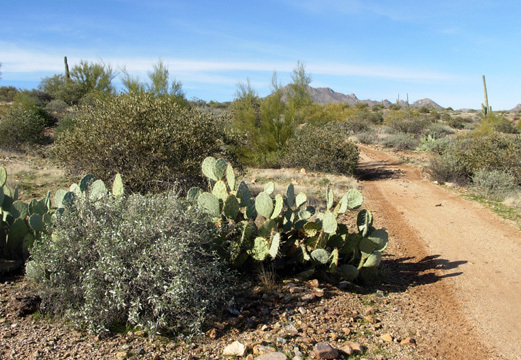 If you enjoy either running lots of miles on scenic desert trails in moderate fall temperatures or just want to watch costumed runners doing all the work, go run or volunteer at this year's Javelina Jundred ("JJ") on November 15-16 at McDowell Mountain Regional Park! 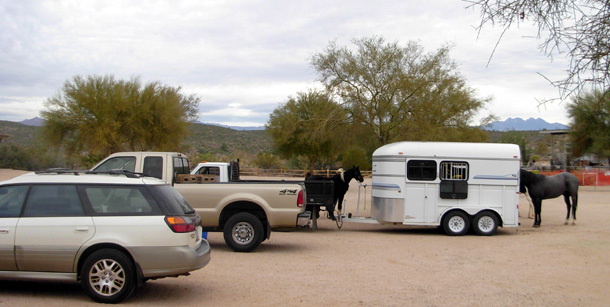 The link is above for information and photos of the popular Phoenix-area event begun by Geri Kilgariff in 2003. Jamil Coury is directing the race this year, continuing some of the fun traditions of previous years while adding his own signature touches. Jim and I first ran the Pemberton Trail in February, 2004. 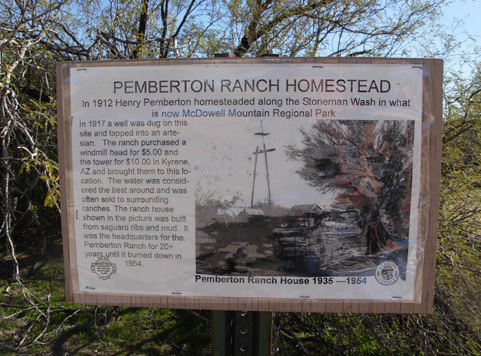 I had fun doing the Pemberton 50K, two CCW loops of the 15.4-mile trail. Neither of us has run "JJ" but we think it would be fun to participate as runners or volunteers. Most of our runs the last two-plus weeks have included part or all of the Pemberton Trail. 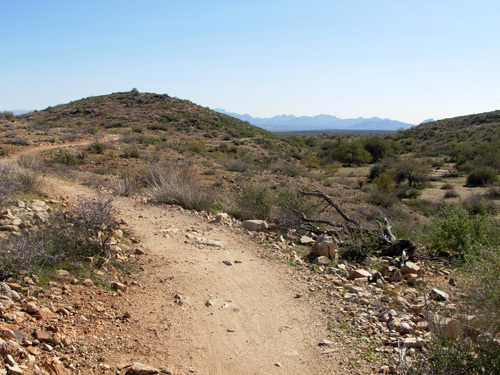 I'd rank the entire trail as "moderately easy" for its undulating terrain and mostly-smooth footing. There are some rocky areas on the south and west sides but even this rock-challenged klutz (me, not Jim!) can run over them fairly comfortably. 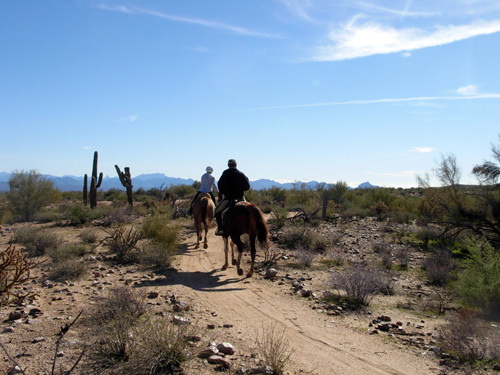 This trail is also a dream to ride -- either on a mountain bike or horse. Our biggest regret this entire trip has been that we didn't bring our bikes with us. We considered it but in our rush to leave in December (after finally deciding what our plan would be) we forgot them. Next time . . . 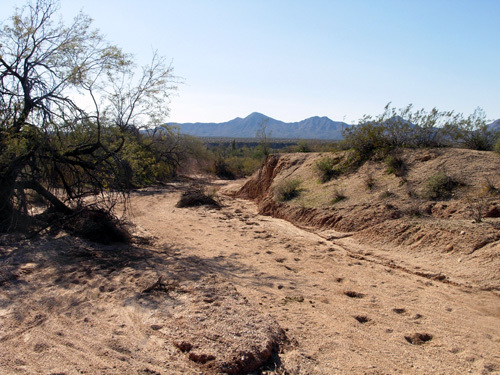 There are no water sources along this trail unless you're in one of the races mentioned above, so be sure to carry plenty. 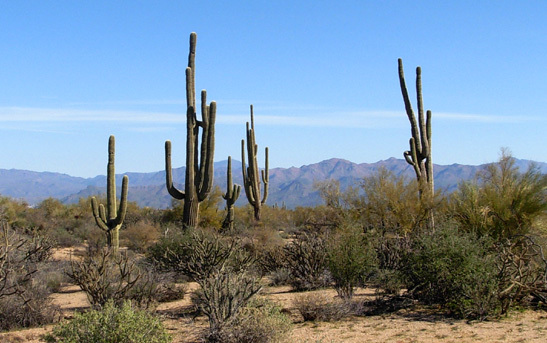 Even in cooler months it's easy to get dehydrated quickly in the very dry, warm air. Ditto sunscreen; we've been using it even in January. When I'm running alone I also carry a cell phone here. We have a decent Verizon signal in the park. 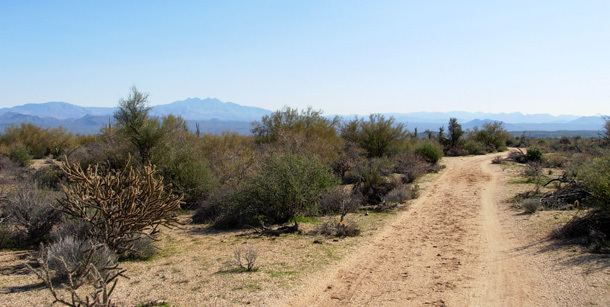 The Pemberton Trail is the largest loop around the park. The photos that follow are from various days in January. 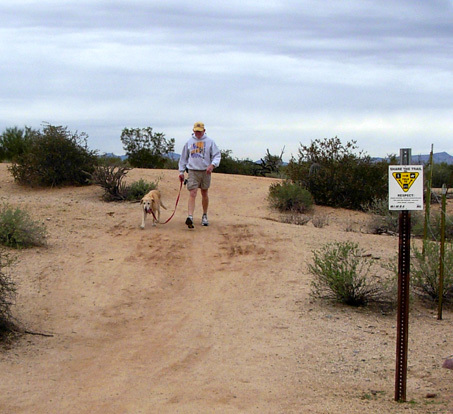 Some are heading CW and some CCW, but they will be in the general order in which they are located along the trail. I'll use the clock analogy so you can more easily see where we are on the loop. I'm repeating some photos I've already shown you to give a more complete tour around the loop. At least half the pictures are new, however. 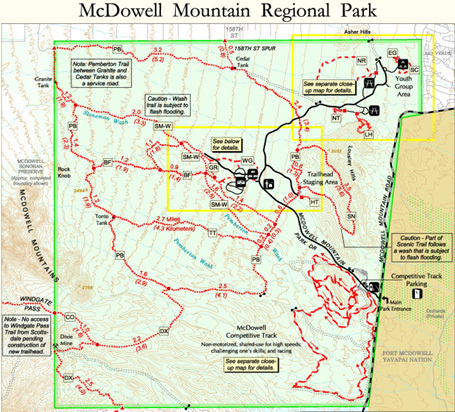 The trail begins at the main staging area, crosses McDowell Mountain Road (black line through right side of map) and proceeds south and west to the Dixie Mine Trail. 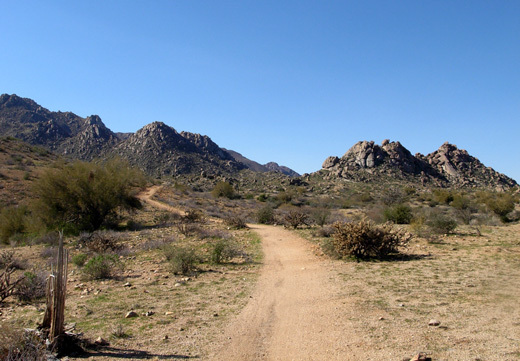 It passes the trailheads for Stoneman Wash, Bluff Trail, and Tonto Trail. This is the low end of the park so either direction on the Pemberton Trail from here is uphill. 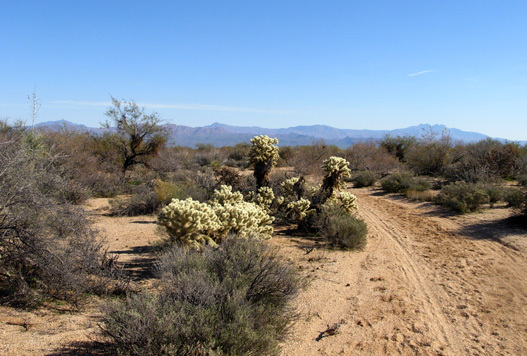 This part of the trail is fairly sandy, through and across various washes, then gets progressively rocky as it approaches Goldmine Trailhead. 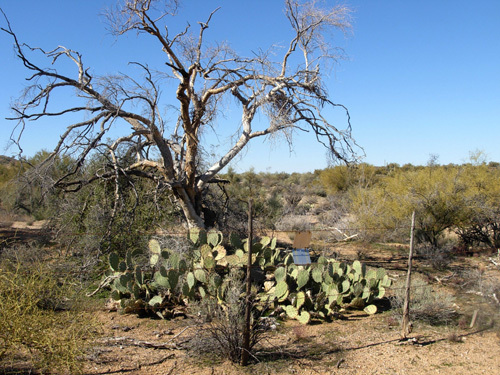 The old ranch house was made of Saguaro Cactus ribs and mud! 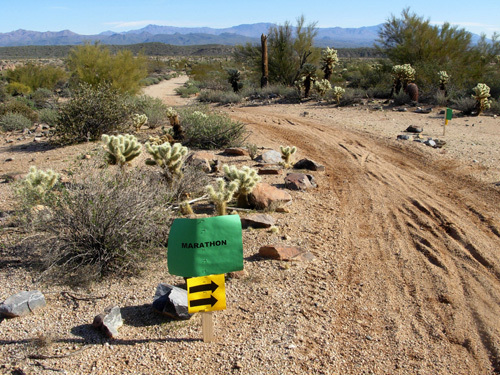 "Marathon" sign at intersection with dirt road to competitive track on January 12. Not sure if it was for a race on feet, bikes, or horses. 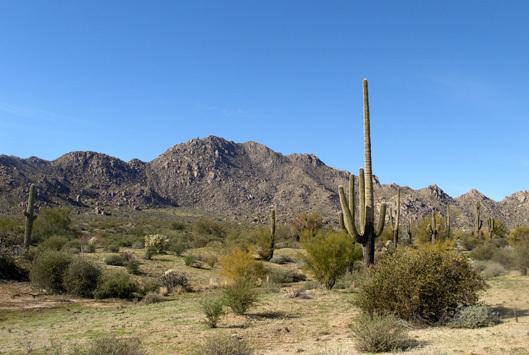 Now we're near the 7-oclock position on the loop and heading in a northwesterly direction in the foothills of the McDowell Mountains. This segment ends in the upper left corner of the map (let's call it the 11 o'clock position). Elevations range from about 2,000 to 3,000 feet in this area of the park, although the Pemberton Trail never gets as high as 3,000 feet. 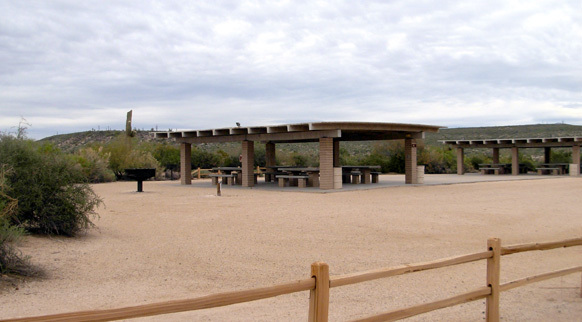 The views are magnificent since you're looking down over most of the 21,000-acre park and beyond to Fountain Hills, the Verde River valley, and Asher Hills. If the fountain is flowing, you can see it clearly from much of this section (see photo in January 17 entry).. 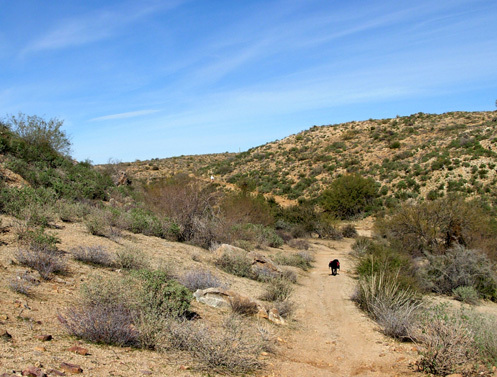 The trail through the western part of McDowell Park roller-coasters through the foothills and gullies for the next five or six miles. 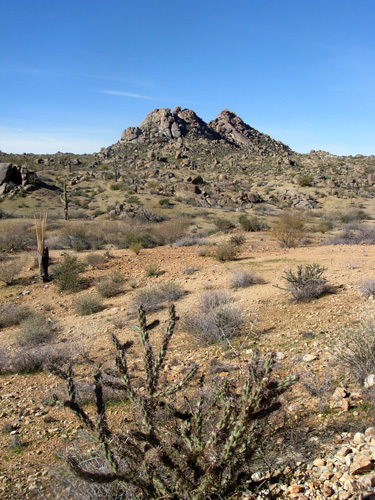 Parts of it are rocky but most is fairly smooth and very runnable. 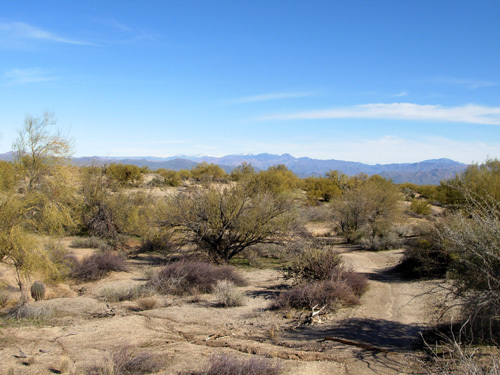 We'll pass three trail intersections at Tonto Tank, Bluff Trail, and Stoneman Wash, go by Geri Kilgariff's commemorative bench at Tonto Tank, and wind through the interesting rock formations at Rock Knob. 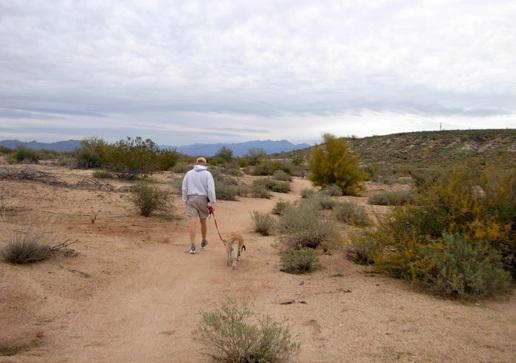 Cody follows Jim up the trail through the scenic Rock Knob area. This is about the 9 o'clock position in the loop. We've gone 6.5 miles so far and are in about the 9 o'clock position on the loop. Let's continue north on the Pemberton Trail. Limb art. 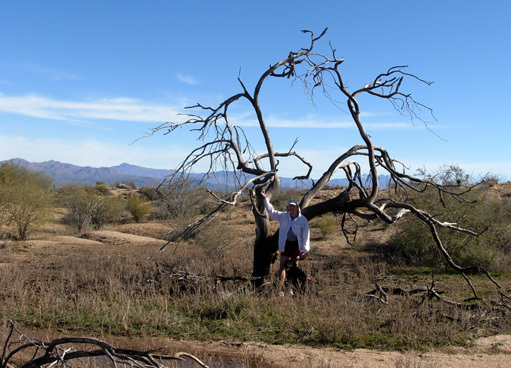 Jim and Cody stand near a dead ironwood tree. Oops! 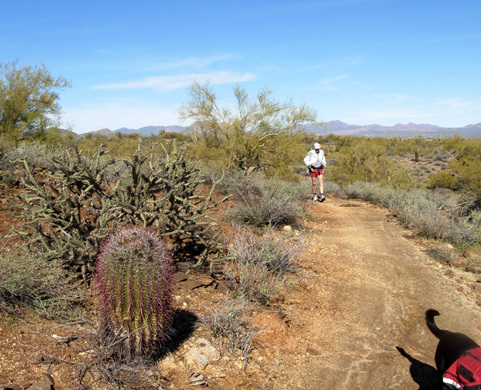 I captured Jim and the cool Barrel Cactus but Cody was too fast for me. 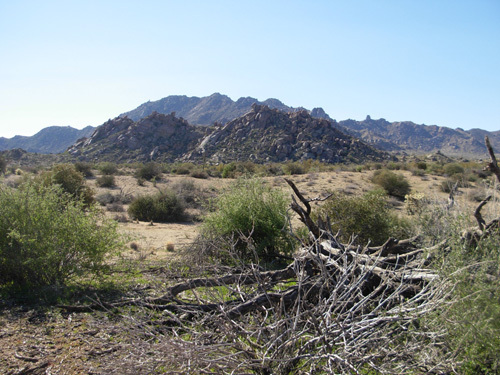 Granite Tank is near the 10 o'clock position on the Pemberton Loop. 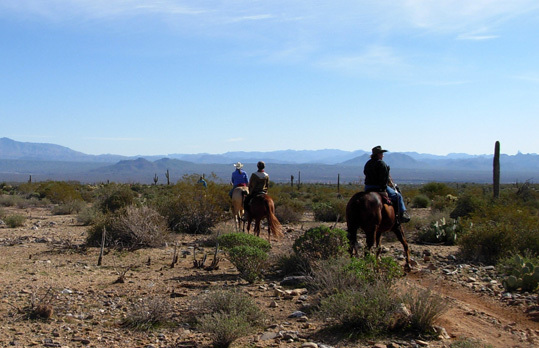 After crossing (unmarked) Stoneman Wash, you know you're there when you see a livestock pond and begin following fence lines that mark private ranch property for about a mile. The trail is still single-track here. 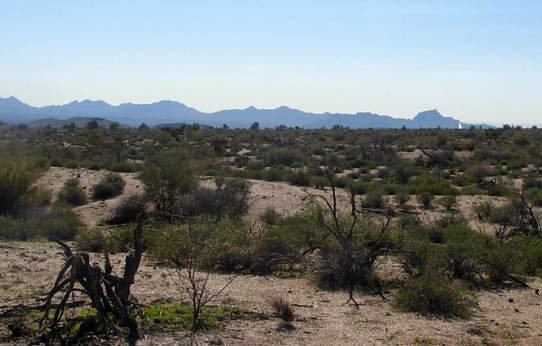 Looking north and east, you'll see ranch property, a few houses, the Archer Hills, and the valley where the town of Rio Verde lies. I showed a couple photos of that in the January 18 entry. 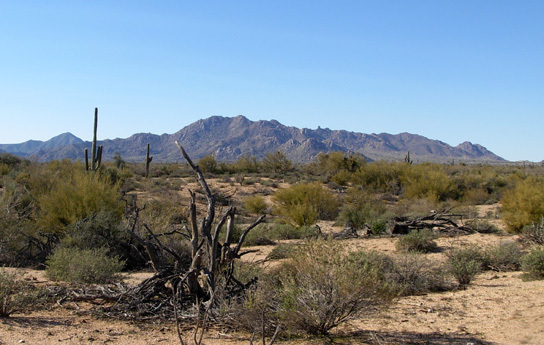 To the west are the McDowell Mountains. 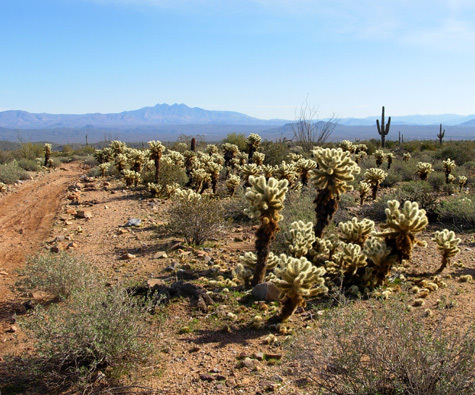 This is the only place I saw any Yuccas along the Pemberton Trail. 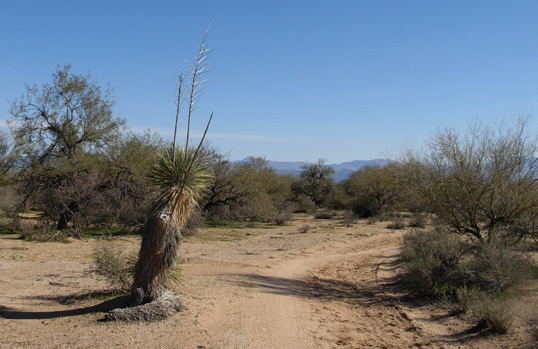 These stately desert sentinels are frequently seen along the trails. Horses graze at Cedar Tank near the 158th Street Spur. Now we are just 3.2 miles from the end at the Main Trailhead Staging Area. A little bit past Cedar Tank the Pemberton Trail veers to the southeast (about the 1 o'clock position on the big loop) away from the service road and becomes single-track again. 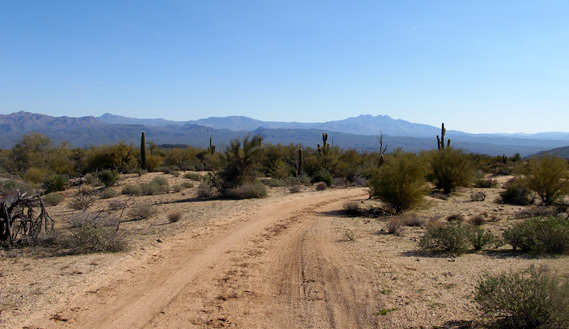 The trail is smooth and fast, still a net downhill in the CW direction we're going. I've shown photos from this section several times previously. 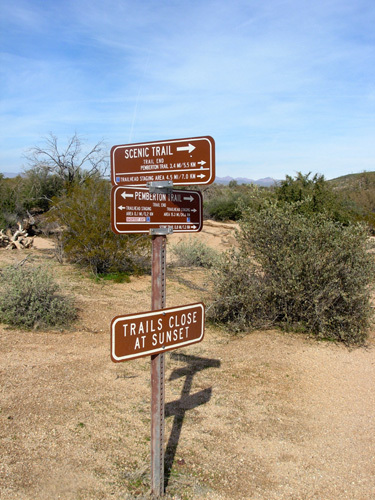 The trail crosses McDowell Mountain Park Road the second time (in the 2 o'clock position) and passes both intersections to the Scenic Loop Trail before returning to the Trailhead Staging Area (3 o'clock position). Now they're going CW again -- nice downhill finish to the staging area! And we're done with our tour of the Pemberton Trail. This is the ramada at the Trailhead Staging Area. Whew. Hope that vicarious run, hike, or ride didn't wear you out too much!